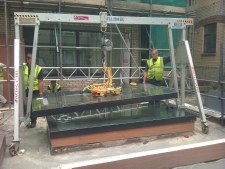 At Specialist Lifting Solutions we offer a specialist lifting service for all of your heavy and awkward items using specialist lifting equipment we can lift and move items up to 10,000 Kg with ease. writing task specific risk and method statements are part of a daily routine. all of our employees are trained to the highest level in health and safety and are CSCS registered. With our ladder lifting systems we can lift and move loads up to 400 kg with a lift hight of up to the 10th floor quickly and safely. 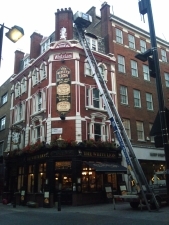 ideal for lifting items through windows or onto rooftops. This is often chosen on sites with limited access or busy roads etc. Site surveys can easily be arranged. 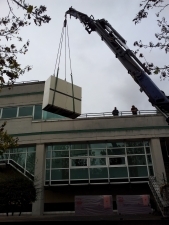 With lorry mounted crane systems we can lift up to 1.5 tonnes at 31 metres ideal for larger and heavier items at height. 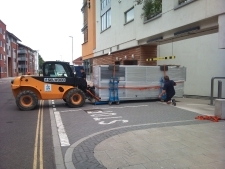 Specialist Lifting Solutions use a fleet of custom built lorry mounted crane / Hiab vehicles with lifting capacities from 2 to 85 t/m tonnes, to lift and shift these are operated by remote control for flexibility. The vehicles collect and deliver nationwide. We can offer years of experience in the specialised field of removal and relocation of heavy containers, portable cabins, generators, machine, general engineering and industrial materials as well as the removal and installation of signs and pylons security cameras etc. Heavy delicate and awkward items.